The dice game Boggle has often been lovingly referred to as the original 3-minute word search game. Popular for decades with young and old alike the game continues to be popular and has seen many new incarnations to adapt to modern technology. Boggle can now be played online, or simply downloaded onto your PC, true testament to the fact that a fun, simple game can continue to gain new fans. Most people who play Boggle will be familiar with the traditional box version of it as released by Parker Brothers/Hasbro. The box consists of a tray with 16 dice in it, all the dice have different letters printed on each of their sides. To start the game, the tray is shaken and the dice will fall into the spaces showing only the top side of each. The letters shown on this side will then be used to make as many words as you can within a 3-minute time slot. The game usually comes complete with a timer also. 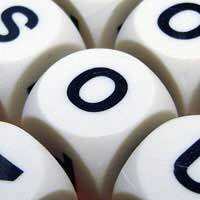 All players play Boggle at the same time and the aim is to find as many words as possible by using adjacent letters. Within Boggle, the term adjacent means that you can make words with cubes that run vertically, diagonally and horizontally. All the words in the game always have to be over three letters long and it is acceptable to use the plural to gain more points if you want to. The hardest part of Boggle is that you’re not allowed to use the same letter more than once per word, so you have to look for good runs of letters on the board to score the big points. Each player is responsible for their own scores and must write down each word they make. Once the timer runs out after three minutes, it’s time to look at everyone’s words and count the scores up. When it’s time to look at everyone’s list of words in Boggle, players must read aloud the words they have. If anyone replicates a word another player also has written, this word is removed from the scoring for that round. This is where the skill of Boggle lays, you must try to think of words other people may not see as obvious. The only variation on that should be noted is that the dice that has QU on one side counts as two letters even though it’s on the one side of a dice. The reason for this is that most English words that have a Q in them are immediately followed by a U. There are two main approaches to playing Boggle, the focused approach and the global approach. If you play with the focused approach, you will focus on one small section of the board and try to find every word in that area. This means you won't miss many words and are more likely to find a lot of variations of words too. The downside to playing this strategy is that you may miss some obvious words elsewhere because you're so focused on one area. With the global approach, you check out the entire board at the one time so you can scope for any obvious words that are available. You'll find words more easily this way and you won't tend to find you'll run out of time as quickly as with the focused approach. The only downside to this type of play is that you might miss out on some of the variations, but overall a mix of both approaches it probably best. The popularity of Boggle has meant that is has been reincarnated in many varying forms. You can purchase Junior Boggle, which is very popular with younger players as well as Boggle online, Travel Boggle and Boggle Deluxe. For word game fans, there are really few better alternatives to the classic game of Boggle.